Literacy is a term that actually scares a lot of people, especially if they were not a fan of their English classes. Despite the heavy emphasis on reading and writing, literacy also includes skills that can benefit people’s lives even outside the classroom. Hence, literacy regards obtaining the “motivation to read and engagement in the learning process…build[ing] confidence in their ability to comprehend and learn from content area texts…[provides] growth opportunities, encourages self-determination, and provides informational feedback about the usefulness of reading strategies and how the strategies can be modified to fit various tasks” (IES Practice Guide 26). The first half of this definition explains that literacy revolves around an individual’s ability to interact with a text. The second half of this definition states how literacy also involves skills and strategies that benefit the individual even without a particular content-specific approach. To dig deeper, literacy that we are more familiar with, and see in classrooms, includes “specific instruction on text structures, organizational patterns, and linguistic conventions commonly found in expository texts, they were able to transfer these skills to independent reading tasks with unfamiliar expository material” (IES Practice Guide 33). This definition of literacy is most beneficial to teachers and students; however, literacy is not only seen in the English classroom. 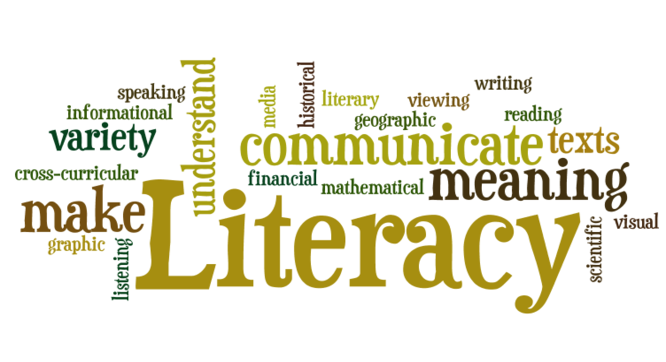 Each subject has a responsibility to teach their students these elements of literacy. For example, in Social Studies or History classes, students can build their confidence in understanding text by participating in a debate and they can examine the text structures and organization patterns of old government documents. In addition, in Science classes, students can build self-determination to comprehend a text by conducting trial-and-error experiments based on the information and they can learn linguistic conventions of the science content through the structure of a hypothesis and formula of reaction. I think visualizing data is very similar to learning a human language, with the only difference being that in human languages, this can be seen in many different ways. For example, one way to visualize data, especially in the classroom, is by “creating graphic organizers, which are visual portrayals or maps of the relationships among key concepts represented in texts, can help struggling readers integrate and process information” (IES Practice Guide 33). Graphic organizers are proven to be beneficial to students in the attempt to comprehend and sort content information. By filling a graphic organizer in with data, such as quotes and facts, students can see the information in a logical and clearly connected format. These methods of visualizing data include venn diagrams, cause and effect charts, web diagrams, and other charts which sorts information so students can have a clearer picture of what they are learning. On the idea of how human languages have more formats of visualizing data, this can be seen in classrooms, as well as in life in general, as making goals. It is a common practice for students and teachers to create goals that will drive their instruction and learning and keep them focused. The article suggests that this will occur when you, the teacher, “monitor students’ progress over time as they read for comprehension and develop more control over their thinking processes relevant to the discipline. Provide explicit feedback to students about their progress. When teachers set goals to reach a certain standard, students are likely to sustain their efforts until they achieve that standard” (IES Practice Guide 28). By having a goal, students can visualize where they want to end up which will help them plan and prioritize their work in the classroom in order to reach this goal. I find that both graphic organizers and goal setting are very beneficial and common to all classrooms. Graphic organizers are used in English, such as a venn diagram; in Social Studies or History, such as a cause and effect chart; in Science, such as a KWL chart; and Math, such as an input/output diagram or pattern chain. What is interesting is how a KWL chart is a graphic organizer that actually involves goal planning. A KWL chart is a three column chart with the first column being what students already know about the topic, the second is what they want to know, and the third is what they learned about that topic. The middle column will help the students form their goals because they will write what they want to find out which will drive their learning, research, work, etc. The article suggested many recommendations for implementing their teaching strategies into our everyday classrooms, but two of these recommendations stood out to me. The first recommendation is to “make literacy experiences more relevant to students’ interests, everyday life, or important current events” (IES Practice Guide 28). The idea of making instruction and content relevant to students’ lives is very important because if a student sees what they are learning to be useful and significant for them both in and outside of the classroom, then they are more apt to want to focus on learning it. For example, in the classroom, literacy can be connected to current events. A Social Studies or History class could read new texts of legislation or a transcript of a debate. A Science class, such as one I had in middle school, could have weekly research that requires students to read an article that appeared in the news that relates to the field of Science. The second recommendation that resonated with me is how “intensive interventions might involve repeated reading, provision of adjunct questions to scaffold comprehension, and questioning for understanding to improve the reading outcomes of adolescents” (IES Practice Guide 35). This recommendation provides teachers with strategies that help release the responsibility of learning from the teacher to the students. Repeated reading helps students catch things that they may have not seen or understood the first time they read it. Questioning helps students think critically and allows teachers to see what students are understanding. For example, in a classroom, repeated reading can benefit students who are confused or need clarification. A Math class would use this strategy when reviewing word problems because not all information in the problem may be relevant and it may just confuse the students. In an English classroom, students are taught to read a poem twice, the first time for overall tone and meaning and the second for specific observations and analysis. In addition, questioning can be used in all types of classrooms to help students further comprehend information and for them to practice higher order thinking. A Social Studies or History class might use questioning when talking about the differences between political parties and what their opinions on different topics would be, which shows that not only do students comprehend the information, but they can apply it/ use it. A Science class could use questioning throughout an experiment to keep track of thoughts as well as lead up to the creation of a hypothesis or formula. You did an outstanding job responding to these literacy readings. Here is the online home for CS for Teachers at Pace University for Spring 2019. Gerald Ardito on Reading Response Unit 3 Visualizing Data ( 4 days ago ): Skyler, You did an outstanding job responding to these literacy readings. Gerald Ardito on Twinery Language Logs ( 19 days ago ): Jade, You did a very nice job with this language log.